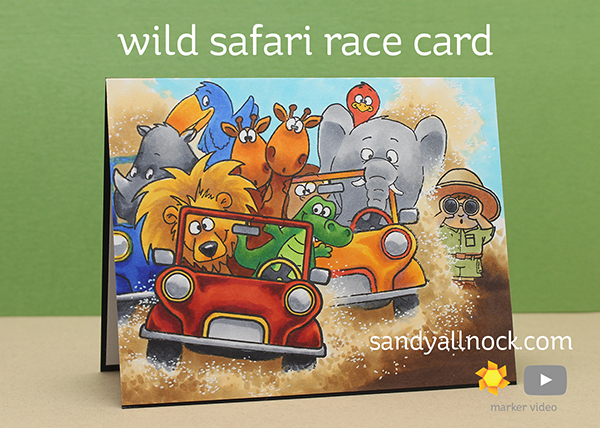 Wild Safari Race Card – guest post over at Gerda Steiner! Hello everyone! I’ve got a guest post over at Gerda Steiner Designs – in advance of a sale coming up over the weekend (shhhhh!)!! Go check it out and let me know whatcha think! I’ve got a little treat for you all next week, so be sure to come by! I could just give you a hug Sandy because 3-4 times per week you make me crack a big smile. I love everything that you create and am so envious of your many talents. You rock! I enjoyed the video and the adventure! I love this card. I recently got these stamps and I can’t wait to try my own had at a little race scene. Thanks for the inspiration! LOVE LOVE LOVE IT! You blow my away with your creativity! Ha! I guess I should have read this before posting it. You blow ME away with your creativity. Oh my goodness!!! That is AMAZING!! Love it!!! Taking extra time on cards is worth it. Look at the incredible result. Thanks for sharing it. You are awesome! So full of greatness. Love, love, love it. So cute!! Awesome as usual! What an AWESOME desert scene! Fun! Super awesome. Doesn’t look like the park Ranger has much control of this situation. I enjoy when your dog’s participate in your videos. Funny, funny card! And you were having so much fun doing it, I just had to chuckle all the way thru the video! OMG – elephant nose!!! I’m still laughing about that one – we must be related because I say stuff like that all the time! I guess we have too many words on our brain’s hard disk! But you sure nailed the name of the little giraffe horns – who knew?! Well, Sandy did – YAY Sandy!!! And, this card is a good example of why it’s worth the extra effort to spend more time on some cards. Thanks for another great tutorial – I hope you’ll add this one to your gallery!!! love this wild and crazy card!!!! does look like you had fun putting it together!